A reaction in which a more reactive element replaces a less reactive element in a compound. A reaction in which a more reactive element replaces a less reactive element in a compound. 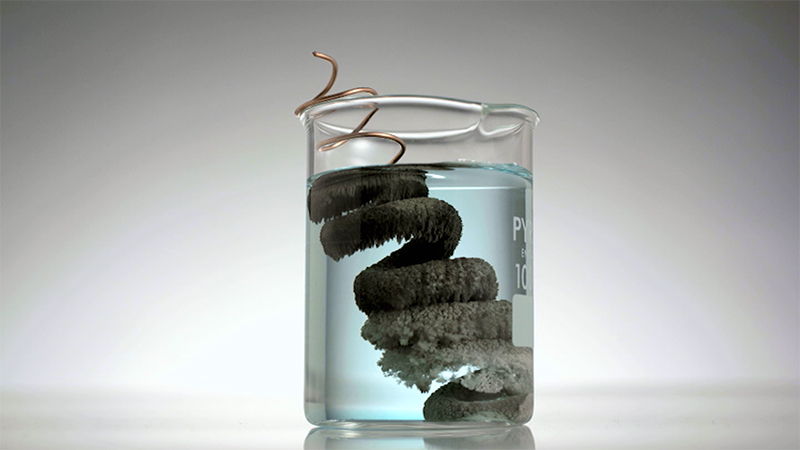 Copper is more reactive than silver, so will displace silver ions from a silver nitrate solution. The copper atoms lose electrons and become ions and the silver ions gain electrons to form atoms, which form a solid coating on the surface of the copper. The copper ions have displaced the silver from the solution, changing the clear silver nitrate into blue-coloured copper nitrate. Copper is more reactive than silver, so will displace silver ions from a silver nitrate solution. The copper atoms lose electrons and become ions and the silver ions gain electrons to form atoms, which form a solid coating on the surface of the copper. The copper ions have displaced the silver from the solution, changing the clear silver nitrate into blue-coloured copper nitrate.